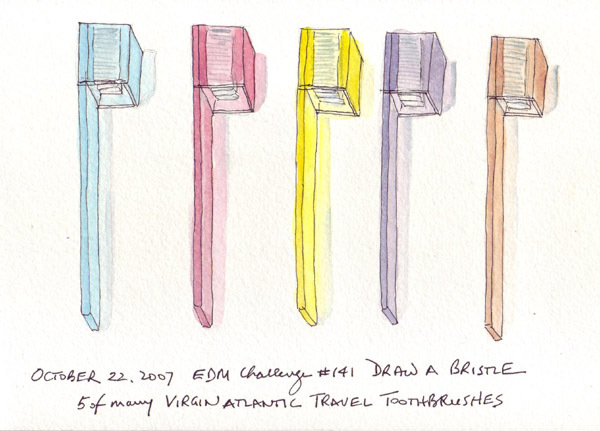 We have accumulated many unused Virgin Atlantic travel toothbrushes from our trips between London and New York last year. They are all in the cabinet in our guest bathroom in case one of our guests forgets a toothbrush. I love the many colors - and the toothbrush was always accompanied by travel socks and one pen in the same color in the travel pouch. I continue to sketch figures - a few each week. 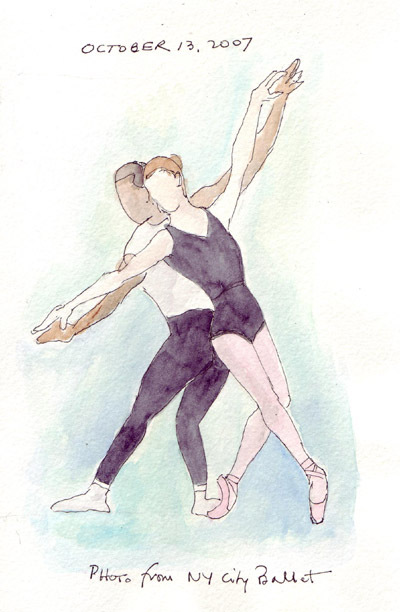 All of these dancers were drawn from photos. 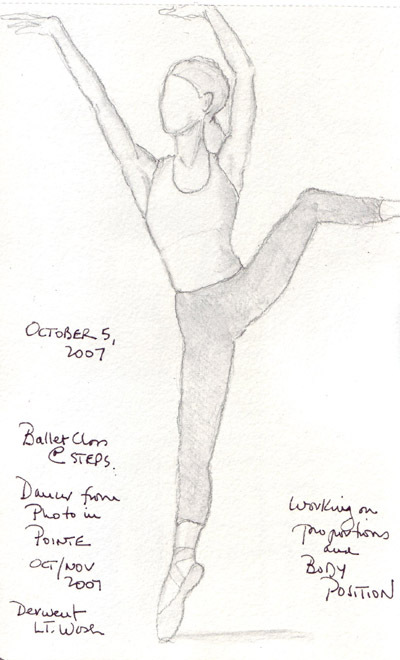 I still don't draw any faces, but feel more comfortable with dancers bodies than I did at the beginning of 2007. Wonder when I'll be be brave enough to try a whole person? Bad planning on my part, so I wasn't able to fit all of the dancer on the page! 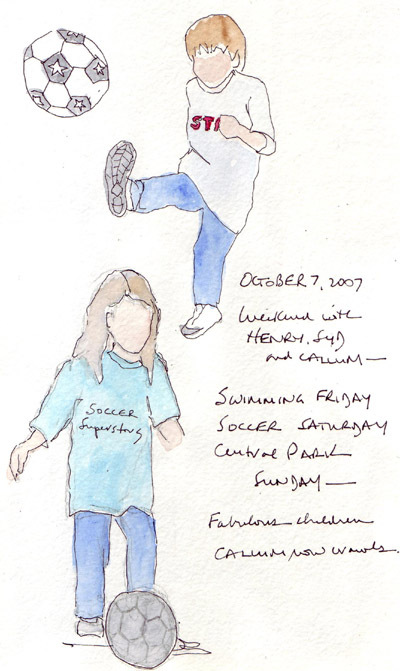 We took our grandchildren Henry and Sydney to their soccer class last week and I sketched these soccer players from photos on their brochure. 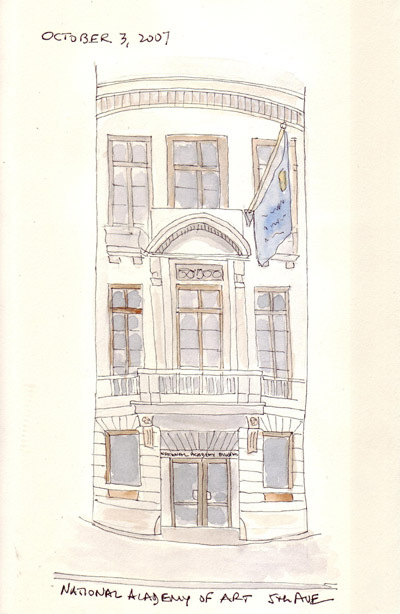 During our year of London Travel, I filled 3 Cachet Linen spiral watercolor sketchbooks. I love having the envelope in the back of Moleskine notebooks and quickly realized that I needed to find and buy large envelopes to glue on the inside of the back cover of these sketchbooks. As we traveled around London, I collected a few postcards from Museum exhibits so I could have inspiration for future drawings. The postcard that I laid across this envelope, on the inner cover of London #2, is from the Royal Academy of Art Rodin exhibit. 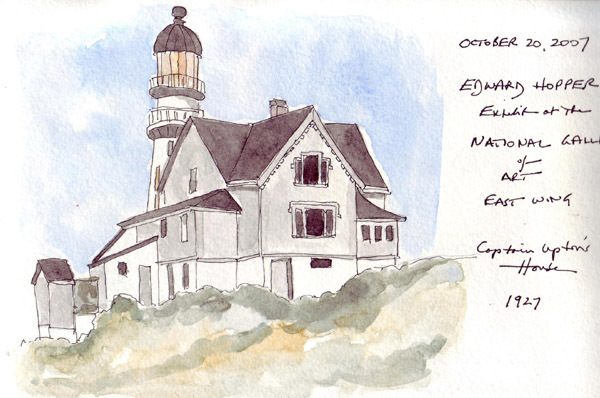 Here is my sketch from the postcard. 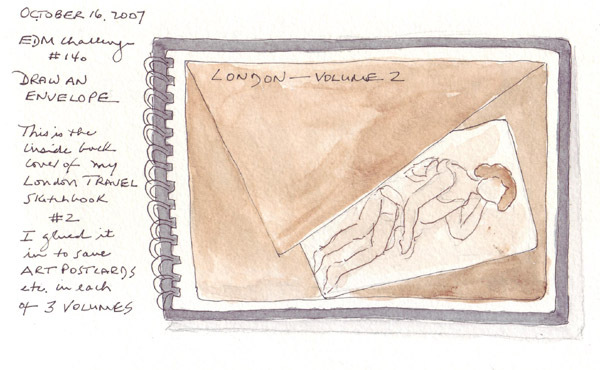 The writing on the page from January 7th says "sketched on a 747 somewhere between London and New York." I still try to do occasional sketches of Manhattan, as if I am a tourist in my own town. While waiting to meet my daughter and grandson one rainy day this month, I sketched the National Academy of Art - which is just north of the Guggenheim Museum on 5th Ave. 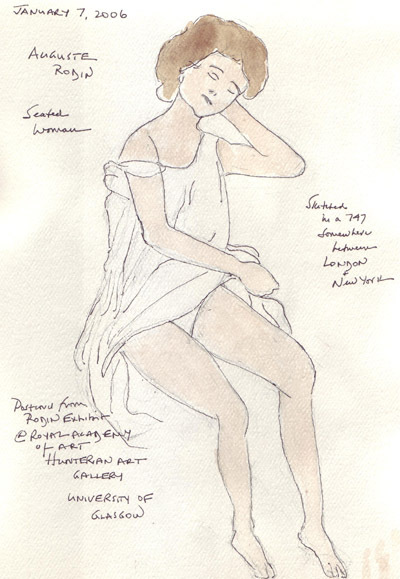 I also did my first sketch of the Status of Liberty - from a poster - using a Juniper Green watercolor pencil. The head and the uplifted arm had to be redrawn.